A collection of video art by feminist artists belonging to All My Independent Women network, with works from 2005-2012 by Miguel Bonneville, Genève Brossard, Catarina Carneiro & Sameiro Oliveira Martins, Carla Cruz, Anna Drdová, Phoebe Eustance, Mónica Faria, Risk Hazekamp, Anna Jonsson, Lenka Klimesová, Catherine Long, Cristina Mateus, Susana Mendes Silva, Rita Rainho, Flávio Rodrigues, Erica Scourti, Hong Wane Yang, Evelin Stermitz, and Lenka Vráblíková.
. Vox Feminae Festival, Zagreb, 2012 .
. Brotherton Library, Leeds University, between 8 March and 8 April 2013. We are happy to announce that the video pieces: 'Sweatpants' and 'Female/Femmes', by the Portuguese artist Tânia Dinis, have recently been added to the AMIW Video Lounge. 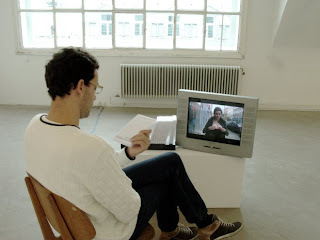 : Who Am #2 (video clip), 14’24’’, 2005. Genève Brossard: Studio Training, 5’48’’, 2010.
: The Ropes, 2'58'', 2004-05. Mónica Faria: Expiation, 16mm transferred to DV PAL, 3’, 2006. Risk Hazekamp: Hands, digital video 2’30’’, 2010.
: Oh, a Pig He Needs Me..., DVD 3'47'', 2009.
: Beautiful is when at Least Two People Find it Appealing, 1'34'', 2009. Catherine Long: Breast Meat, 4'52'', 2012. Cristina Mateus: 29.5.1971 (version 2), 18’50’’, 2010-2011. Susana Mendes Silva: Did I Hurt You?, 3’31’’, 2006.
: Inventory-Diary #3, To Make Right the Step, 58'', 2010.
: Tribute to Itziar Okariz, 1'23'’, 2010. Flávio Rodrigues: 14. November 2010, time, 2010.
: Woman Nature Alone, 10'18'', 2020. Evelin Stermitz: Blue House. Dance improvisation performance, 25’18’’, 2009. Lenka Vráblíková: Interpretation of VALIE EXPORT: Tap and touch Cinema, 2’42’’, 2008. Hong Yane Wang: Seating Code, 2'31'', 2010.